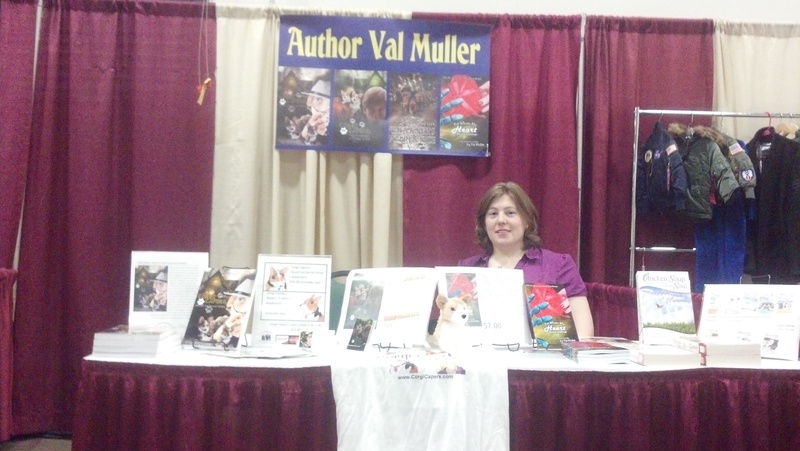 I spent the past weekend at the first annual Fredericksburg Pet Expo in Fredericksburg, Virginia. The two-day event was even more crowded on Sunday, so word must have spread about all the great events and vendors. 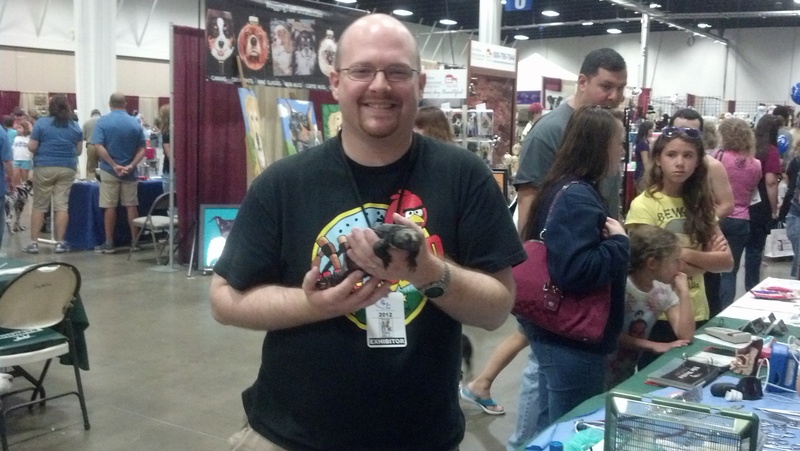 Even though I was stuck at my booth most of the time, I got to see some of what the show had to offer, and I recommend it for animal lovers everywhere. On Sunday, the show only ran from 11 a.m. until 4 p.m., and at the suggestion of a fellow vendor (specializing in dog training), I brought Yoda along, leaving Leia with a family member (she got to spend the day with a new dog friend!). Trying to get Yoda to pose for the camera! Those of you who know Yoda know this is not a common sight in such a busy place. There were other animals as well–farm animals, reptiles, and a variety of pets that came in costume or in special hairdos. 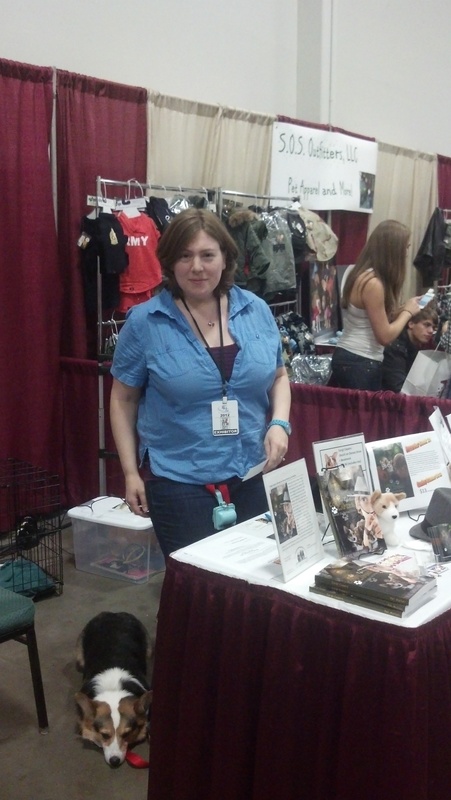 One patron even stopped by with the calmest cat I’ve ever seen simply resting on her shoulder as she walked from booth to booth. 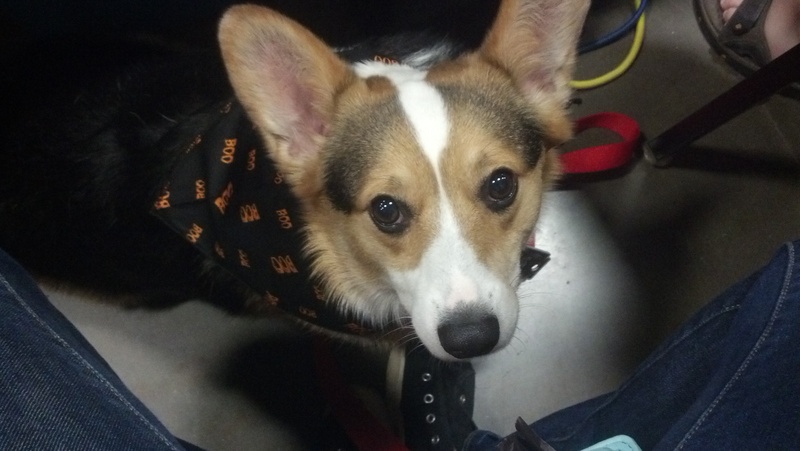 Because the corgis’ birthday is September 25, Eric said we could buy them each a Halloween bandana. Yoda showing off his “Boo” bandana. Appropriate for a fraidy-dog! 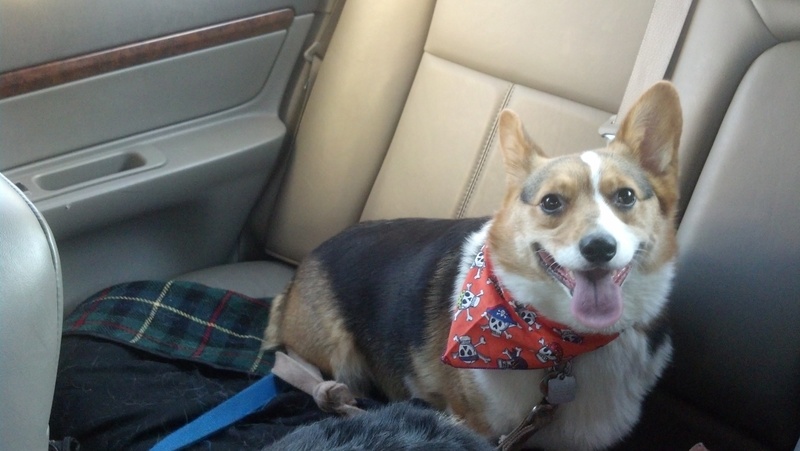 Later, in the car on the way home, Leia shows off her pirate skull bandana. It was a busy weekend for everyone, and the dogs slept like little corgi-shaped logs all the way home. A special shout-out of thanks to the event coordinators at the Fredericksburg Expo Center for hosting such a great event… and a shout-out to the guy from Doody Calls who spent the whole weekend circling the Expo Center floor with a mop and bucket to clean up after all the dogs! 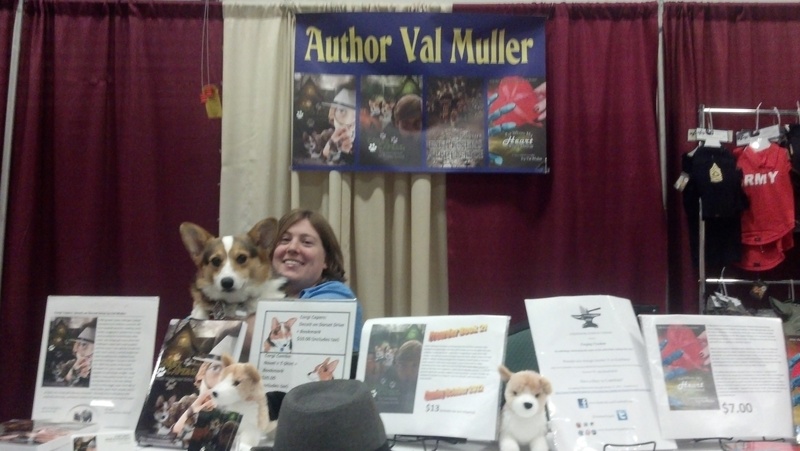 Posted on September 25, 2012, in character, corgi, corgi capers. Bookmark the permalink. 1 Comment. Sounds like you had fun. 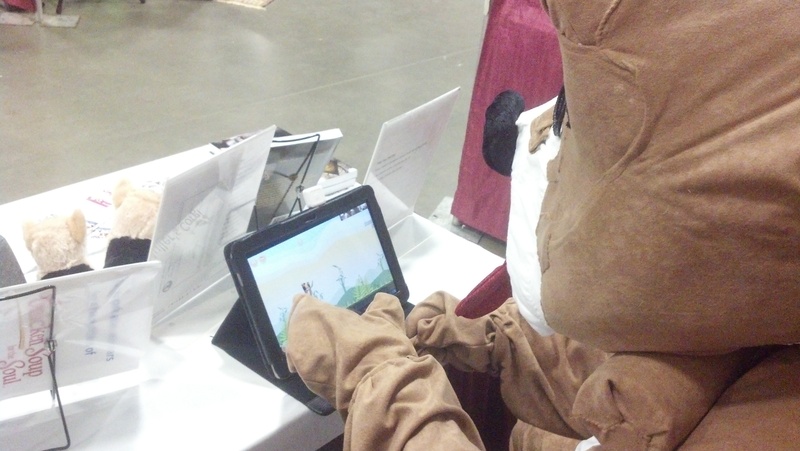 I wonder how Corgi the mascot managed the computer, but I guess you don’t need opposable thumbs for games any more. Loved the Doody Calls shout out–what a great name.